Sadly, this was written so long ago, I am not sure who to thank. But thanks to everyone who has read it and enjoyed it over these past few years! The top photo is created by Woedenaz. 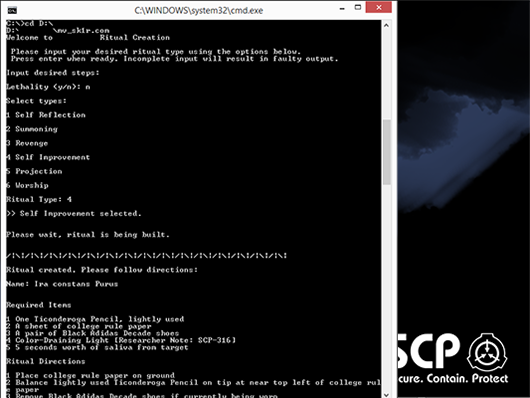 SCP-2105 running on local computer in Room 382-C in Research Facility-12 immediately following Experiment-2105-α1. Special Containment Procedures: A single copy of SCP-2105 is to be kept in a secure lockbox in Room 382-C in Research Facility-12. Personnel are allowed to experiment with SCP-2105 within Room 382-C, but only after a thorough psychological examination and under direct supervision of a researcher with Level-3 security clearance. All experiments are to be logged and placed in File 12-2105-C.
Any rituals generated by SCP-2105 discovered outside of containment are to be quickly destroyed by any means immediately upon discovery, including any results of said rituals. Any civilians involved in rituals will be administered Class B Amnestics and all their electronics will be confiscated and destroyed. Mobile Task Force Gamma-5 ("Red Herrings") is ordered to track down and contain SCP-2105 and any rituals generated by it. Description: SCP-2105 is a DOS program called "mv_sk1r.COM" and is compressed in a .tar.gz archive that also contains a .txt file [Designated DCMT-2105-1], both of the same name. Please input your desired ritual type using the options below. Press enter when ready. Incomplete input will result in faulty output. When the program is activated with all inputs filled, the program generates an anomalous output that can often be interpreted as a religious ritual with some statistical anomalies.1 Any rituals generated by SCP-2105 will be referred to SCP-2105-1, SCP-2105-2, etc. During testing, it has been found that these rituals will only be usable by the user that generated them and only while the user possesses a text copy of the ritual.2 If all copies are terminated the ritual will cease to function. Rule 4 is currently the primary focus of testing as it has the most bearing on the results of the ritual generation after the program settings themselves. For example, it has found if the user's intention is to kill someone they dislike, the ritual will often result in something to cause the target harm. Many D-Class's results were rituals that physically transported themselves outside the facility. Available results of experimentation do not suggest how the anomalous effect of the rituals manifest. After careful cross-referencing of Foundation Data with over a thousand rituals generated, there has been found to be a limited but significant connection to the Church of the Broken God. mv_sk1r.tar.gz was discovered on the computer of a University of South ██████ computer science student ██████ ██████ [Designated W-2105-001] after his public trial for the murder of [REDACTED]. The Foundation took custody of W-2105-001 during his widely televised trial for the murder of his roommate. W-2105-001 had originally been arrested after being questioned about his roommate's disappearance. The Foundation took interest in W-2105-001 after reviewing the original logs by the local police. After further interrogation by Researcher Michaelson (See Interrogation-W-2105-001), all items owned by W-2105-001 were confiscated and W-2105-001 was taken into custody. Description: A 14 cm x 14 cm x 14 cm cube with a pyramid-like lid composed of a highly corroded copper. Object is covered in markings found to be a text from Shang Dynasty [1250 BCE] surrounded by zoomorphic patterns set in a low relief. 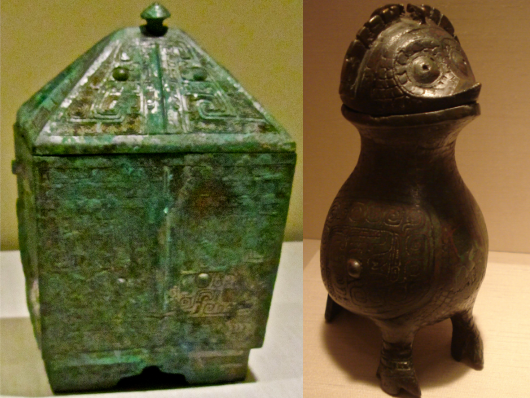 The interior of the object contains an object found to be a Shang Dynasty ritual wine container in the shape of an owl. Organics among us do not belong. Drink! Drink and be organic, you faithless among us who do not belong. Call out to Jade Emperor. He will not come for you. Place yourself under his gaze and find your whims bent to your every knowing. For the mutilated among us will find themselves hungry for integration. Write these whims with oracle bones and find them alive among your parchment. Hypothesis: While speaking in riddles is chief among the Church of the Broken God's dogma, I believe it may be possible to parse a meaning out of this nonsense. After discussing this matter with Dr. Forsyth, we believe that the anomalous properties of SCP-2105 may be a transference of a belief among primarily the "Church of Maxwellism"(GOI-004C) found in their "Gospel of the Sixth Network - Chapter 2: Comments. "4 This section is generally interpreted by members as a tacit acceptance by their god to modify this world's "source code" in any way they see fit in order to fulfill their goals. We have no proof of this outside our educated guess, but Dr. Forsyth and I believe that this program may have been made for this purpose. 9999 PRINT "ERROR: CHECK IF COMPLETE"
1. 90% of the rituals often are symbolic of their results, 8% are nonsensical either in items or actions needed. 2% are known rituals used by the Church of the Broken God. 2. This includes screen printouts, written copies by hand, pictures taken by any camera, or shorthand copies of rituals not containing the full text of the original. 3. If any of these conditions are met, the user is terminated as a result. 4. //Original Text: WAN spoke to the believers and found them afraid of their power. He wrote among their source and allowed them to mark this mutilated world into completeness. He spoke, and the fragmented word compiled.